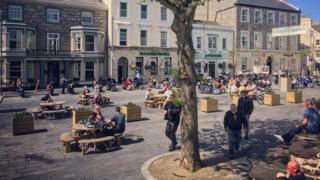 Plans to "permanently pedestrianise" a town square at the centre of the Isle of Man's ancient capital have been announced. Castletown Commissioners voted to reclaim the square as a public place last week and will now write to government to request the change. Chairman Colin Leather said it should be used as a "civic space unique to the town and benefit of the community". Some local businesses oppose the move because parking spaces will be lost. The local authority will also propose changes that will increase the amount of free short-stay parking at other sites in the town.